55-3251 at Davis-Monthan AFB., Tucson, Arizona. 55-3251 stationed with 95th Strategic Wing, at Goose Bay, Labrador. 55-3251 awaiting refurbishment at Boeing Field, Washington. N5323G with CAP, at Elmendorf AFB., Anchorage, Alaska. • 55-3251 United States Army. Delivered on 12th March 1956. Initially attached to 14th Army Aviation Company, Fort Riley, KS. Re-designated 1st Aviation Company and moved to Fort Benning, GA. Delivered to White Sands Missile Range, NM., with the Army Air Operations Directorate as a range support aircraft, flying from Holloman AFB until Mar-1974. Jul-1974, it was flown from Edwards to Davis-Monthan AFB., AZ., where it was prepared for transfer to the USAF. • 55-3251 United States Air Force. Initially allocated to 95th Strategic Wing, Goose Bay Air Base, Labrador until 16th May 1975. • N5323G Civil Air Patrol (CAP). 16-May-1975. Alaska CAP titles. Based at Elmendorf AFB., Anchorage, AK. • N5323G Salt River Air Cargo, Phoenix, Arizona. ntu. Aircraft remained parked at Phoenix for several years. • N5323G Purchased by Glacier Bay Airways, Gustavus, AK but was lost on the delivery flight and never actually registered. Accident: Grenville Channel, Hartley Bay, BC. 08-Jun-1989. At approx 4,000ft the engine exploded covering windscreen with oil. The aircraft was ditched in choppy water and the pilot and passenger evacuated into the water. They were rescued and recovered to Port Hardy. The aircraft sank and was not recovered. base at Fort Riley. In August 1956 the 14th Army Aviation Company was re-designated the 1st Aviation Company and moved to Fort Benning, Georgia where it continued to fly the Otter until 1961, when it converted to the Caribou, relinquishing its U-1A Otters to other units. By January 1962 53251 was assigned to US Army Electronics Command, Fort Monmouth, New Jersey, whose aircraft were based at the nearby Monmouth County Airport as there was no airstrip for fixed wing aircraft at the Fort. During 1964 the Command's aircraft moved to a new base at Lakehurst NAS, New Jersey. One Army aviator recalls his involvement with the Otter: “I arrived at Lakehurst in February 1965 and was there until the end of January 1966. The Otter was used for transportation, not as part of the aircraft test fleet. We used it to transport the Martin Baker ejection seats from the Grumman OV-1s to the New Cumberland Army Depot, Pennsylvania and to support various missions at Fort Devens, Massachussetts. We also provided VIP service to Washington, DC as well as for pilots to get their four hours per month flying time while attending school at Fort Monmouth. We operated out of one of the two large blimp hangars at Lakehurst, the Naval Reserve being in the other one. The fleet of aircraft attached to Lakehurst had at least one of each type in the inventory - C-47s, Caribous, Mohawks, the Otter, Beavers, H-19, CH-21, CH-34, CH-37 plus UH-1s, OH-13s, OH-23s, a Beech C-45 and several U-8Ds and Fs. When a Chinook was required it came from a base in Virginia”. 53251 continued in service at Lakehurst until February 1968, when it headed west to the White Sands Missile Range, New Mexico as a range support aircraft, flying from Holloman AFB, where it replaced Otter 53250 which was being sent to Vietnam. The operating unit at Holloman was the Army Air Operations Directorate and 53251 was to be the last Army Otter to serve at the missile range. Its taskings at the range came to an end in March 1974 when it was flown to Edwards AFB, California, where it was parked until June '74. The following month, July '74, it was flown from Edwards to Davis-Monthan AFB, Arizona where it was prepared for transfer to the USAF. 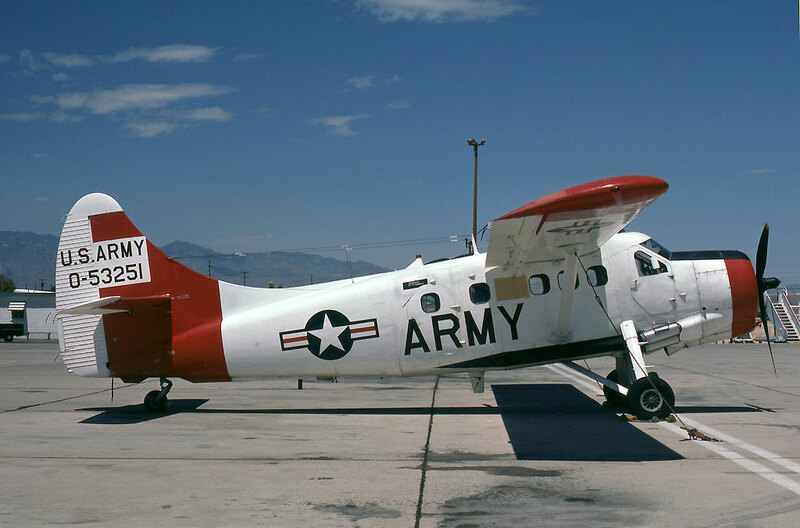 It was allocated to Goose Bay Air Base, Labrador to replace another USAF Otter which had crashed. It made the long ferry flight from Davis-Monthan, outside Tucson, Arizona to Labrador. At Goose, 53251 flew for the USAF's 95th Strategic Wing alongside its surviving Otter 81696. These two Otters continued to serve the Wing until 16th May 1975, when the USAF withdrew its aircraft from Goose Bay and both Otters were transferred to the Civil Air Patrol (CAP). 53251 was registered N5323G and 81696 was registered N5324G. 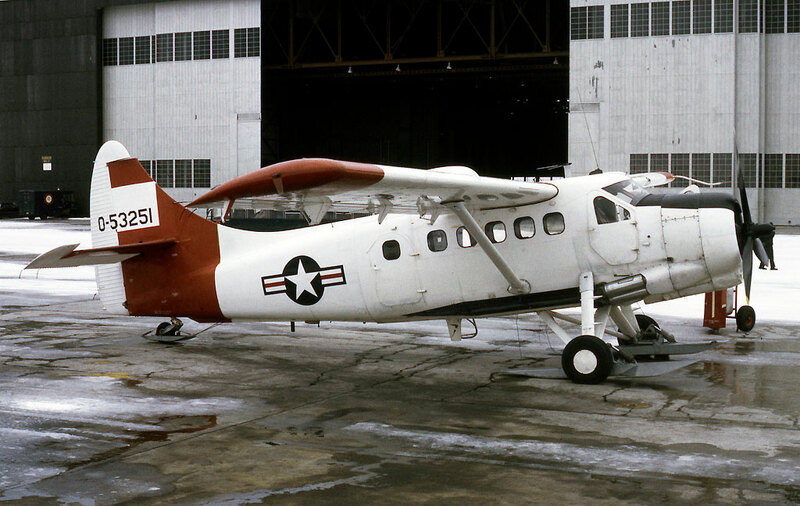 Both Otters were flown in wheel-ski configuration all the way from Goose to Boeing Field, Seattle, still in their red/white USAF colours with the civilian registrations applied for the purposes of the ferry flight. They were both seen at Boeing Field in June 1975, where they were to be refurbished by Harold Hansen. In the event, the other Otter was disposed of, but 53251 / N5323G was painted in full Civil Air Patrol colour scheme, with Alaska CAP titles. It was noted at Boeing Field on 4th January 1977 about to depart to Elmendorf AFB, Anchorage from where it was to serve the CAP's Alaska Wing for the next nine years. In December 1986 N5323G was sold, the purchaser being a pilot based in Phoenix, Arizona who intended starting a freight operation under the name Salt River Air Cargo, although the operation never got going. The Otter remained parked at Phoenix for a few years, and for some reason was registered in January 1989 to the pilot's sister, Ellen Sue Richardson of Ann Arbour, Michigan although N5323G remained parked at Phoenix. It was put up for sale and bought by Glacier Bay Airways of Gustavus in the Alaskan panhandle. This company had been formed in 1969 and by the mid 1980s was operating a fleet of five Cessna U206s. The company decided to upgrade to larger aircraft and to acquire two Otters. 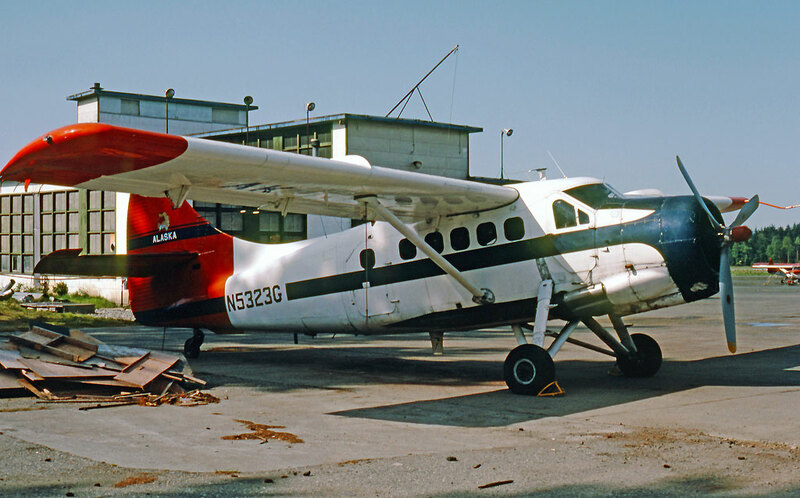 The first Otter it acquired was N58JH (131), purchased in June 1989 from Jim Harkey of Auburn, Washington, just to the south of Seattle, and this Otter was delivered from Auburn to Gustavus that month. 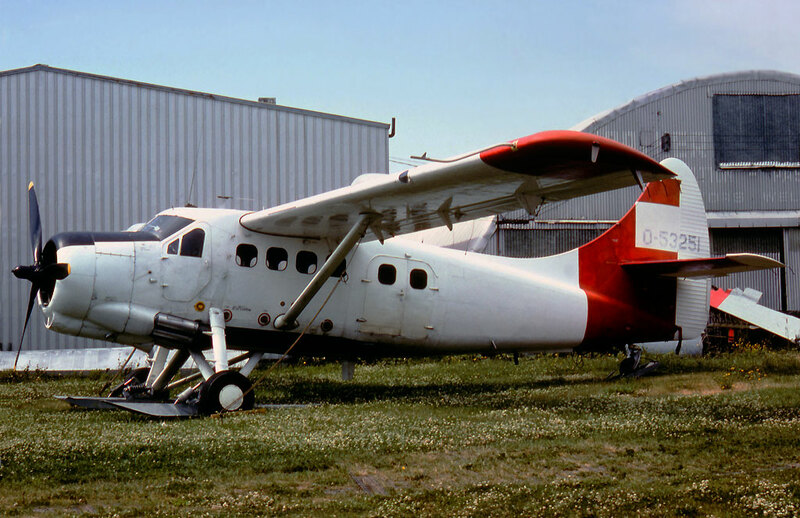 N58JH was to be operated as an amphibian, and the company also purchased N5323G that same month intending to operate it on wheels. It would be used to fly fish from the Excursion Inlet cannery to Juneau, as well as for general charter work. One particular task for which it was intended was to transport “river rafters”. The sport of white-water rafting is big business in this area, on the Alsek River, which runs into the Gulf of Alaska at Dry Bay, north of Gustavus, Groups come from all over the country to participate and these would be flown by the Otter from Gustavus to where they would commence their river experience on the river. 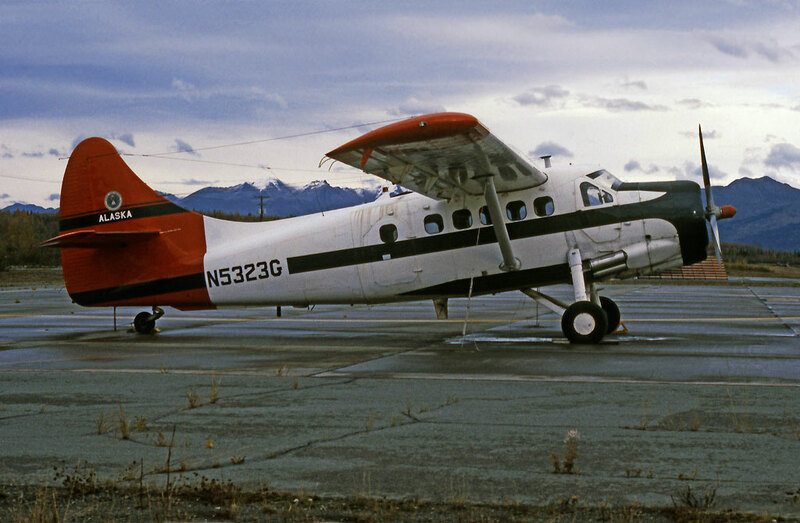 Glacier Bay Airways arranged with the seller of N5323G that he would ferry the Otter from Phoenix, Arizona to Auburn, Washington where some work was to be done on the aircraft. Art Hayes, proprietor of Glacier Bay Airways, and his co-pilot Dan Mills picked the aircraft up at Auburn. Before setting off on the delivery flight, they bought $30,000 worth of Otter spares from Harold Hansen in Seattle, and these were loaded on board N5323G as were the wheels of N58JH, the amphibious Otter which had already been delivered to Gustavus. For the new Glacier Bay Airways Otter operation, they purchased ten Western Airlines life jackets from a surplus store in Seattle and these too were loaded on board '23G, as well as the personal luggage of the two pilots. The Otter then set off on the continuation of its delivery flight to Gustavus. They flew from Auburn to Port Angeles, Washington to refuel and then flew on to Port Hardy, on the northern part of Vancouver Island. The next stage of the delivery flight on Thursday 8th June 1989 was from Port Hardy to Prince Rupert, BC which would have been the last refuelling stop before the final sector to Gustavus. Dan Mills, the co-pilot tells what happened: “En route from Port Hardy and just short of Hartley Bay, while cruising at 4,000 feet, the engine let loose with a loud violent explosion, covering the cowlings and windscreen with oil. We knew right away that complete failure was imminent but for now it kept limping along at significantly reduced power. Our forced descent was slow and allowed us time for a few options. I flipped through the manual to search for any source of help to arrest the rapidly reducing oil pressure on the gauge, to no avail, while Art communicated our predicament to the Canadian Coast Guard in Prince Rupert”. “We contemplated Hartley Bay as a suitable ditching spot as well as Kitimat. We elected to press on, getting as close to Prince Rupert as possible. We crossed the southern tip of the peninsula on over to Grenville Channel, descending slowly. I retrieved two of the inflatable Western Airlines life vests from the aft cabin and secured the rest of the cargo. I donned mine and then assumed control of the aircraft while Art worked on his. At about this time, the oil pressure gauge pegged and very shortly thereafter the engine erupted into the most violent shake imaginable. I raised the nose to stall the propeller from windmilling, for fear the engine would dislodge itself from the mounts. I had never encountered such a shake and had envisioned the plane descending in an uncontrollable attitude without an engine. That brief moment, I guess ten seconds, was the only time in which I thought our lives may be in jeopardy. Almost as suddenly as it started, the shaking stopped as the crank had now finally seized”. “He did a masterful job of putting the aircraft in the water at a slow speed into a strong headwind. We took green water over the windscreen but she just popped right back into the upright position. I remember seeing water rush in and Art exiting out his door as I did mine. I tried to swim around the head of the plane but could not make any headway into the three foot chop. Finally I just dove under the belly and inflated the vest once I was safely in the clear on the other side. I didn't see Art as I swam toward the shore. It turns out he swam into a kelp island near a semi-flat little spit of land. I on the other hand had spent too much time trying to get around the plane. By the time I reached the shoreline, the current had carried me down to a vertical cliff I could not climb. I had to swim another twenty yards to grab a tree branch and pull myself out of the water”. “I started to feel the cold as I hobbled my way back towards Art. We watched the Otter disappear under the surface after another minute or so, way down the channel, sinking in deep water. As we stood there, I shivered uncontrollably from the cold, thinking it would be mighty cold if one had to stay the night. Not too much time passed however before a Canadian bush plane flew by and then landed out in the chop. As I remember, it was a Pilatus Porter full of passengers and it was too rough for him to do much for us without damaging his floats. He departed but we knew then for sure that the Coast Guard chopper would soon be there, and within twenty minutes it was. The big Sikorsky hovered near the rocks as we climbed aboard and headed back to their station at Prince Rupert. The next day, a Glacier Bay Airways Cessna 206 flew down and took us home to Gustavus”. N5323G had sunk in the deep waters of Grenville Channel and was never recovered.